Back in April 2013 some friends contacted me about joining them for a cruise down the Rhine river. They were considering a cruise with Viking Cruises which was running a special deal: if we signed up for a 2014 cruise before 30 April 2013, we got 2-for-1 pricing. Having never been to that part of Europe before I was on board immediately. As I was flying from a different city from the rest of the group, I handled my own airfare. It just so happened that in the fall of 2012 US Airways was running one of its targeted sales that offered a 100% bonus on purchased miles. I had made two purchases of 25,000 miles (+ 25,000 bonus miles) during that sale. I was able to buy both at the beginning and the end of the sale which split the charge over two credit card cycles for me. The total for both purchases with taxes was ~$1800 and left me with a 100K US Airways Dividend miles balance. Since the time I purchased those miles I’ve learned not to buy miles speculatively (without a pre-planned purpose). But it was great to have those miles in reserve when I needed them! I would not typically use these miles on a domestic fare (unless it was really expensive) but $1800 is a great price for a business-class ticket to Europe. At the time I used these miles US Airways was part of the Star Alliance. That gave me a great number of choices to get to Europe. Our cruise departed from Amsterdam (AMS) and ended in Basel, Switzerland on a Thursday. Not really wanting to fly back to the States for one work day, one of my friends and I decided to take an extra couple of days and take the train to Zurich (ZRH), spend a couple of days and fly home from there. US Airways allowed one stopover of more than 24 hours OR one open jaw on an award ticket. (An open jaw is where you fly into one city and out of another.) My ticket would be an open jaw since I was flying into AMS and out of ZRH. Even though I had US Airways miles, I knew that the United Airlines award search tool was MUCH better. At the time, the US Airways search tool did not display any Star Alliance partner award flights, which made it useless if US Airways did not fly into that city. Using the United search tool I found a one-stop flight to Amsterdam from my home in Memphis via Houston on United. Sadly, United only flies one-cabin regional jets out of Memphis so no business class for me on the MEM-IAH leg. But that was the only one! In Houston I connected to a United flight that took me non-stop to Amsterdam in a flat-bed business seat. For the return trip I had to make a couple of stops. I originally looked only for flights with flat-bed seats. This led to a complicated itinerary with two stops in Europe before landing in Chicago where I would have taken another one-cabin regional jet home – and I didn’t land until quite late. After I booked this ticket I began to think more about the route I was taking and started looking for alternatives. 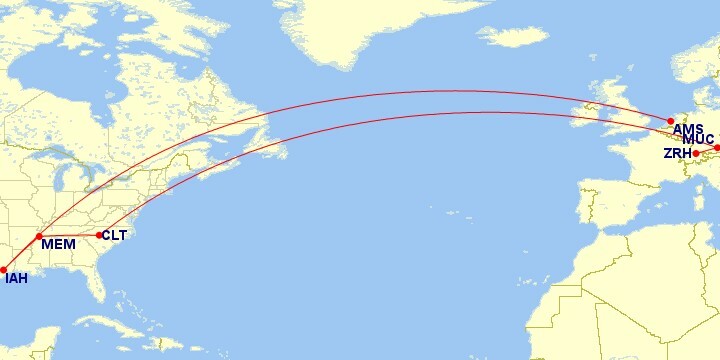 I eventually settled on a Lufthansa flight to Munich (MUC), connecting to another Lufthansa flight to Charlotte and then a US Airways flight back to Memphis that got me home several hours earlier than the trip I’d originally booked. I called US Airways and changed the flights. There was a $150 fee because I’m not an elite US Airways member but I’d decided it was worth it. My flight from ZRH to MUC was on one of Lufthana’s CityLine planes, meaning a short flight in a regional jet. But since I had a business class ticket, I had an empty seat beside me and that was fine for the short flight. I connected to one of Lufthansa’s Airbus A340-600s for the flight to Charlotte. I’d originally avoided this plane since it only has angle-flat seats in business class but I later realized that since this was a daytime flight, I probably wouldn’t be sleeping much anyway – and indeed I did not. My flight from Charlotte to Memphis was also on a Canadair regional jet that featured a first class section. So that’s the “how” I booked the trip. Next up: the actual flight to Amsterdam.